Black Tusk Athletics-What's Your Why? We all find motivation in many forms. What keeps you going to the gym can be completely different from the person who works out next to you. Every person that walks through our doors has a different story; a different history, a different circumstance, a different relationship with themselves and their surroundings. We've said this before and we will say it again, the simple commonality amongst every person in our gym and community is that they want to give 100% of themselves to their "why" during the 60 minutes that they are with us and we are grateful for the 1 hour of their day that they choose to spend with us. For the most part, we know each of our members' "why"; why did they choose exercise, why did they choose CrossFit, why did they choose Personal Training and why they chose us. Every one of our member's stories stands out to us, but there is one in particular that we want to share today. In the fall of 2010, Julia had just turned 25 and was on a little family getaway to the mountains for her birthday with her spouse and wee babe (who was only 6 weeks old at the time). In the blink of an eye, her, Marko and their baby girl went from being on a happy-go-lucky road trip to being airlifted off the highway with multiple severe injuries. Julia was hospitalized with multiple fractures throughout her entire body, internal bleeding, nerve damage and lacerations. She was unable to walk or bear her own body weight for almost a month. During the first 8-9 months after the accident, Julia was mobile enough to live day to day life, with about 50% recovery. She tried going to a traditional gym to stay active after the accident. Then in 2012 Julia and Marko introduced their son to the world. At that point in time injuries and mobility issues started to creep up again but Julia managed them as best she could. In 2013, CrossFit was on Julia's radar so she tried a few CrossFit classes. 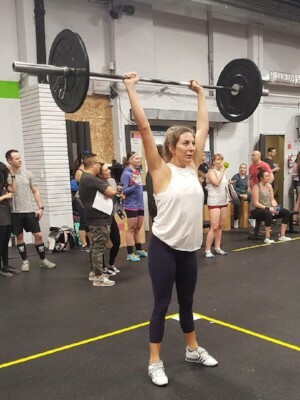 In 2015 she started to see an Olympic Weightlifting trainer and discovered a taste for lifting weights. It was at that time she decided to give CrossFit another try. She, again, tried a few different gyms in the city before finding the right fit for her. When we first met Julia over a year ago, she could not squat below parallel. With her dedication and perseverance she now has full range of motion and has set personal records that would make any coach proud! For Julia, her why's for joining Black Tusk were that she wanted to start prioritizing herself again, she wanted to build strength, to cultivate a fun and challenging hobby and she wanted to be a part of a great community. Your why's might not look like Julia's but that doesn't mean that they are any less important. We all have hardships, roadblocks and obstacles to face and to overcome but once you figure out your why, everything else will fall into place. In case anyone was wondering, Julia and Marko's 6 week old babe in 2010 is almost 8 years old now!